A heat pump transfers energy by moving a refrigerant, which alternately absorbs and releases heat.This process cools fridges, freezers and entire rooms and buildings through heating, ventilating and air conditioning (HVAC) applications. Some refrigerants are organic. Some are inorganic. Some are cyclic, and some are linear. Some are based on methane, and some are based on longer carbon chains. 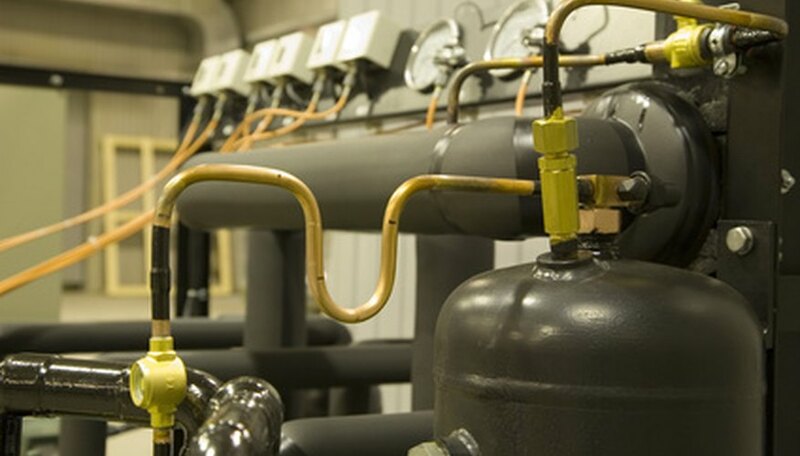 Each refrigerant has its own capacity for transferring heat. The higher its capacity, the more heat it transfers when it moves at a set rate. Divide the heat pump's output, in British Thermal Units (BTUs), by 2,930. If it transfers 150,000 BTUs per hour: 150,000 / 2,930 = 51.2 kilowatts. Divide the quantity of refrigerant that the heat pump moves by the time it takes to move it. If it pumps 3.6 kilograms of refrigerant in 10 seconds: 3.6 / 10 = 0.36 kilograms per second. Divide the answer to step 1 by the answer to step 2: 51.2 / 0.36 = 142.2 kilojoules per kilogram. How Is Heat Transferred From the Sun to the Earth? Menezes, Ryan. "How to Calculate Refrigerant Capacity." Sciencing, https://sciencing.com/how-7610353-calculate-refrigerant-capacity.html. 07 August 2017.